Dear Sir, I write to you today with the intent to focus solely on the economic situation in Saint Lucia, the dire need to raise revenue in order to meet the expenditures of government, and to manage the affairs of the country as you have been mandated to do by the elections of June 6, 2016. As you are aware, the imposition of VAT and the raising of fees over the past few years have been blamed for the downward spiral of our economy because of the tremendous burden which has been placed on both businesses and regular citizens. Your campaign promises specifically stated a reduction of VAT and other taxes and fees as a means of reducing the squeeze on the people of Saint Lucia while finding more creative and equitable means of raising revenue. This clearly was received with great anticipation. As your administration is poised to announce the reduction VAT and other strategies to ameliorate the state of our economy it must be noted that you are now at a pivotal point in the administration of Saint Lucia.. Your decisions today will be discussed and evaluated forever as they become the inescapable history of our island. It is with all this in mind, Sir, that I call on you to raise taxes! Not onerous taxes, but those which have more than just the misguided intention of squeezing every last cent of revenue from the clutched fingers of our people. Ironically, these taxes will ultimately benefit our people even more than what is collected. I dare you, Sir, to now take this opportunity to make a bold move in the interest of this country. A move so uncommon and forward thinking that time alone will prove it one of the most strategic and sensible directions of any politician in our history although many may see it as politically risqué. I implore you to make this tough yet necessary decision. Mr. Prime Minister, I call on you to decisively raise taxes on cigarettes, alcohol, salt, and sugar! It must be noted that these three commodities are collectively responsible for the meteoric rise in health problems in Saint Lucia in the forms of cancer, alcoholism, and diabetes which ultimately result in death. In fact, we now have the dubious distinction of having the highest rate of diabetes in the world. It is a major cause of blindness, kidney failure, heart attacks, strokes, and lower limb amputation. The World Health Organization also states that avoiding tobacco is one of the ways to prevent or delay the onset of type 2 diabetes. 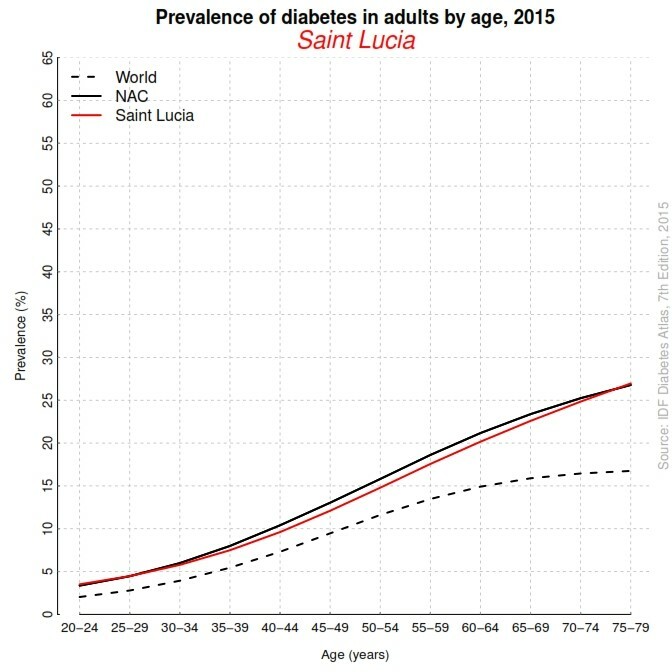 Our alarming rate of diabetes vis-a-vis age, compared to the rest of the world, is clearly indicated by the red line on the graph below. Mr. Prime Minister, when your administration was voted into office it was not solely to make fiscal policies but also to manage and direct the energies and psyche of our people. The direction that we take requires a mental attitude which at times is very lacking. It is therefore your responsibility to identify these deficiencies and steer the country towards that sense of purpose. 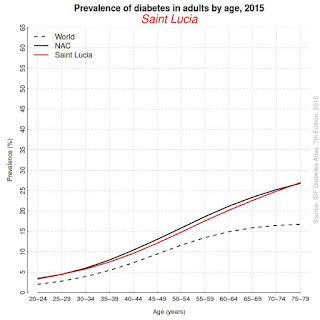 If Saint Lucia is to continue along this path we will all be overwhelmed by an untenable and critical situation requiring significantly more resources allocated to the treatment of these medical problems. This will leave an ever dwindling balance in the treasury for other needs which will have a domino effect on every other sector of our country. Since you have already mentioned the impending increase in the departure tax and re-institution of the airport development tax, a decision which I wanted to suggest, I will advise you to explain the logic to the naysayers. These two taxes will be paid by those who can most afford them and will be offset to locals by the reduction of VAT and other taxes and fees. The more equitable distribution of revenue collection is the critical point to grasp. In the long run our country will be healthier, the quality of life will be better, and the economy will rebound. All of these measures require more than short term plans. We must also implement this change of mindset from the school level which will guarantee our sustainability as the younger generation matures. 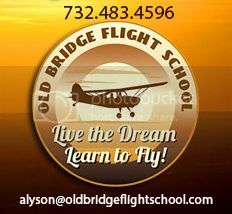 Attitudes and lifestyle are a significant part of the malaise in which we now find ourselves. The detrimental effects of diabetes, cancer, alcoholism, and other serious ailments associated with the 'deadly three' inflict monumental costs to our country in the form of losses in job productivity, efficiency, cost of operations, competitiveness, and more. 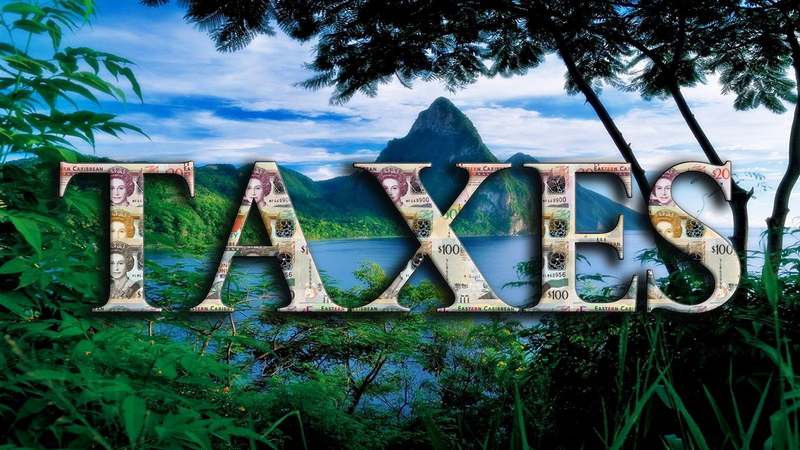 If you make the hard and sensible decision to implement these taxes the ultimate benefit to Saint Lucia will far outweigh any negative criticism. The people are not stupid. History will be on your side. P.S. Mr. Prime Minister, Although we do not see post script notes too often these days, It has been brought to my attention that another matter which deserves attention is the problem which inundates our country especially when it rains. A healthy tax on plastic bottles, Styrofoam containers, and other minimally biodegradable products should at least encourage a move to more environmentally friendly materials. In so doing our inordinate expenses associated with flooding and health issues will be greatly reduced.